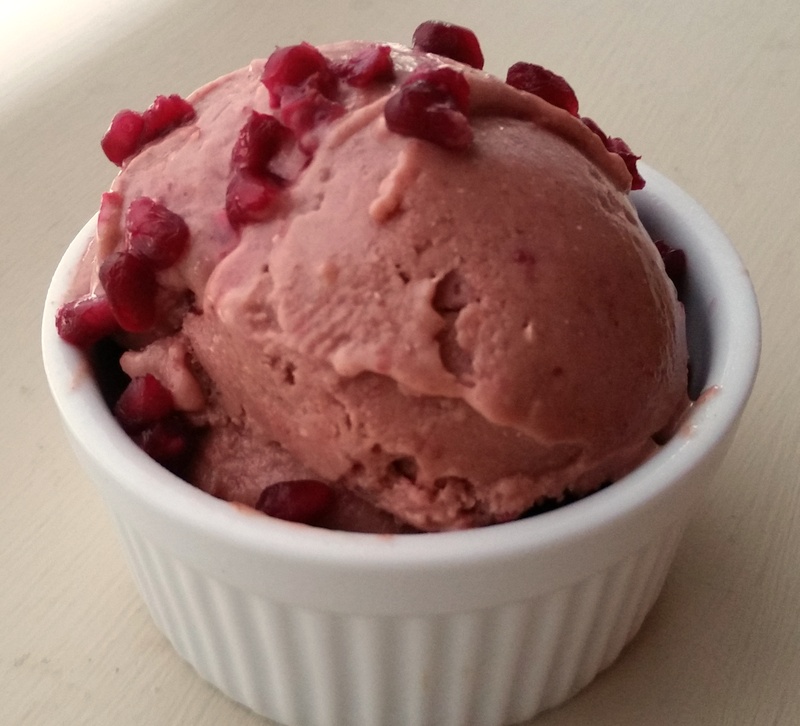 Pomegranates go on sale this time of year, so I froze some along with the applesauce I made recently for a rich sorbet. 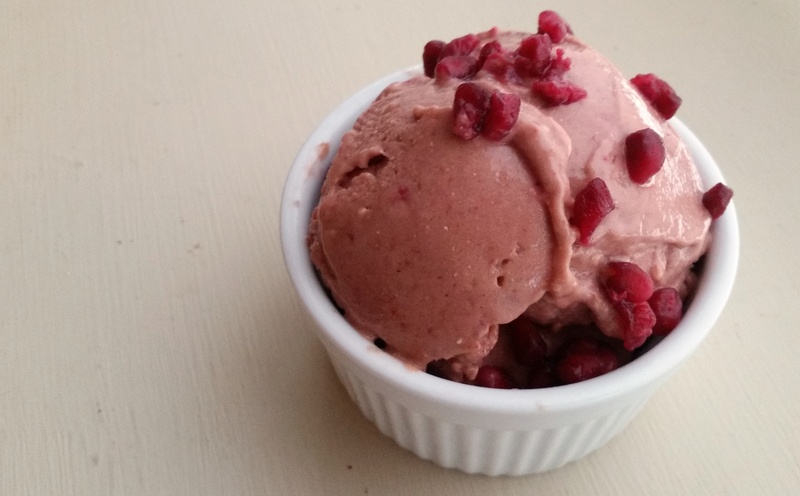 I love how it turned out—delicious, creamy and pomegranate-y. Freeze the applesauce in ice cube trays ahead of time. Alternatively, you can use frozen apple pieces in place of the applesauce. Reserving a few pomegranate seeds aside, put everything else in a blender or food processor (see my previous post for thoughts on blenders) and turn to high power following your blender manufacturer’s instructions. Use the blender’s tamper to force the ingredients into the blades as it blends. If your blender doesn’t have a tamper, turn the power off every 15 seconds to prod the chunks toward the blades and the smooth stuff away with a wood or plastic spoon. Remove the spoon, put the lid back on and star the motor up again. Blend until smooth (30 seconds to a minute in a Vitamix), but don’t overblend or it will start to melt. Scrape from the blender when it’s about the consistency of soft-serve. I use an ice cream scoop to make it pretty. If you want a firmer ice cream, stick your ice cream scoops in the freezer for a couple minutes before serving. Sprinkle with pomegranate seeds before serving. Sorry for taking so long to reply to this. I've been having strange things going on with notifications in WordPress on my phone. Here, there seem to be two different kinds of light coconut milk: the stuff you get in a carton to pour on your cereal, and the stuff you get in a can, which is quite a bit thicker. The stuff in a carton is definitely Waterdown, but the light coconut in a can is more akin to Jersey milk with the cream skimmed off the top, I.e., it's not technically watered down, but because of the lack of fat, it tastes more watery, like nonfat dairy milk. Either way, neither of them is as flavorful as the full fat coconut milk. Since I'm not drinking coconut milk by the quart, I see no reason to avoid the good stuff! Thanks Kathryn - and yes I agree when it's not a daily indulgence full fat is the way to go!